We aim to provide clear pathways that link career aspirations with opportunities in both school and the wider community. Partnership links with educational organisations, sports industry, clubs and organisations are a feature of the program. The Hallam Senior College Sports Academy recognises the importance of providing students with a fulfilling and challenging education that also allows them to further develop and enhance their opportunities to pursue a career in sport; or move on into further education and training and/or work. 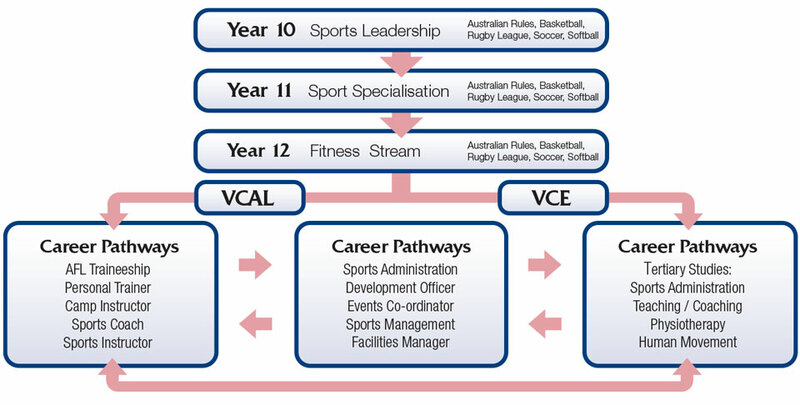 The Hallam Senior College Sports Academy is currently built around sports that were identified as an integral part of Hallam and its surrounding communities. These sports also reflect the school’s culturally diverse population. The sports are used as a tool to keep students interested and engaged in school and to provide them with opportunities to pursue careers in the sport and recreation industry. These pillar sports form the foundation of the program. Alongside the pillar sports, students with specialisms in other sports have also accessed the program. The Hallam Senior College Sports Academy has developed professional relationships with a variety of elite sports bodies including the Dandenong Southern Stingrays, Basketball Victoria and the Melbourne Storm.